The Thanksgiving menu is already set and hopefully you are crossing things off your “To Do” list. Don't forget that Thanksgiving is the perfect time when the family gathers to take those holiday pictures and turn them into holiday photo cards. If you can't decide on that one picture, then make a collage of favorite photos into a holiday card. 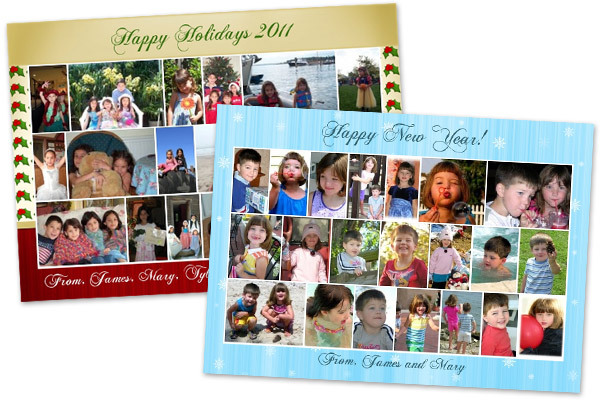 There is an assortment of festive holiday cards templates to choose from. All you need to do to get started is to select photos that have been uploaded onto Facebook. PosterMyWall.com’s card maker will help you do the rest. Here are a few tips to help with your holiday pictures. The first step is gathering everyone together. Go for somewhere with a background that won't be distracting. Watch out for backgrounds that are too colorful, as they can end up distracting from your subjects and clashing with their coloring. 2. Should subjects coordinate outfits? Wearing clothes of a similar color and style (for example, different shades of blue) will look much more relaxed. On the other hand, if your group happens to love dressing up, it might be fun to do a session in costumes! Gone are the days of stiff, posed studio portraits. Today, most people prefer a group photo that shows them as they really are: smiling and happy, without looking forced. Strive to capture the group in ways that appear spontaneous and candid. If possible, shoot from eye level or slightly above your subjects. This will emphasize their eyes and reduce the pesky double chins and undereye circles you sometimes get if your subjects are looking down. However, there are some general guidelines to help you get the best pictures possible. Make sure your subjects are touching each other. This might require some convincing, especially for kids at various stages but it will really bring home the fact that this is a group of people who care deeply for each other. It doesn't have to be more than a hand on a shoulder here, an arm around a waist there, or someone leaning against someone else, but try to get some physical contact going. Arrange your subjects by height, with the tallest in the center. You can also put taller people behind shorter ones, but be sure that their heads and faces aren't being blocked; give them something to stand on, if necessary. Get older family members to hold younger ones, if appropriate. Try having an older sibling give a younger one a piggyback ride or sitting a child up on a parent's shoulders. Huddle up! Have everyone lean in toward each other. Not only does this let you get a closer photo, but it also helps give the impression of closeness. You can even try a literal huddle, like a football team on the field. Position yourself on the ground in front of and underneath them, shooting up, for an unusual photo. Especially if you're working with a very large group, try organizing them in smaller clusters, then arranging the clusters together. Group smaller family units together at a family reunion, for example, rather than having everyone stand in a big, messy bunch. Get some action shots. Have the family play a game or run a short race, and snap candid shots of the action. It's sometimes a bit tricky to catch everyone looking good, but if you luck out, these can be some of the most memorable portraits.